With several new franchise entries and some fantastic iOS ports, it certainly was another strong week of new iOS game releases. 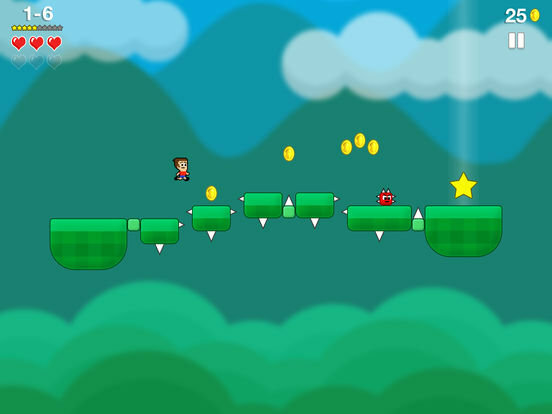 Mikey Jumps combines elements of all three of BeaverTap Games’ previous “Mikey” titles. This latest offering isn’t a speed run game as its predecessors, but instead, it is a one-tap skill-based platformer, which requires players to successfully figure out the correct timing of jumps, swings, flaps and more to safely navigate each of the game’s 200 levels. Every 10 levels you unlock a new location, which adds new elements. Coins collected along the way can be used for attempts at the slot machine to unlock over 250 wearable items, from hats, to mustaches, faces to re-skinned ropes. I’d be lying if I didn’t say that I was a bit disappointed at the lack of the speed run component that the series is known for. I think this exclusion hurts replayability, at least of completed levels, not offering much incentive to replay them once the grouping has been passed. That being said, with 200 levels there is plenty of game here and speed run or not, it is a fun little time waster which you will keep revisiting to see if you push past another level or two to move yourself up the leaderboards. Cubed Rally World expands Jared Bailey’s simple, yet fun, Cubed Rally car dodging franchise where you tap left or right to switch lanes as you make your way around winding 8-bit tracks picking up points, coins and fuel. The direct sequel to 2012’s Cubed Rally Redline, this entry adds a cool new modular concept where collected coins can be used to unlock a total of 30+ vehicles, each of which adds a new, unique segment of track once unlocked. The game offers a nice bit of replayability thanks to its randomly generated tracks and the ease at which you can unlock new segments. Both new and returning fans of the original Cubed Rally offerings, will enjoy this latest evolution. An irreverent and dark humored adventure game, Randal’s Monday follows the misadventures of the title character Randal, a kleptomaniac and sociopath who has been cursed, and is now forced to live out his own Groundhog Day-like time loop as he tries to correct all of the wrong things he did in life. 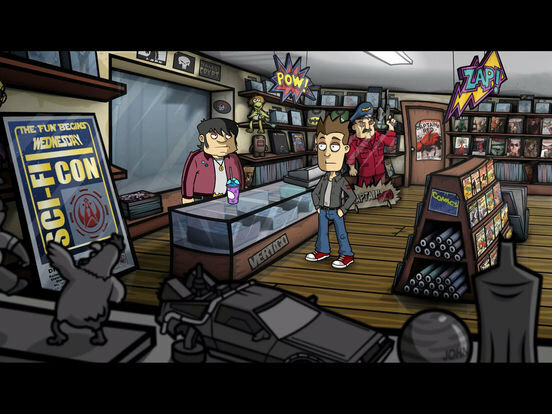 The full game features 7 episodes, the first 2 of which are free with the app download. The remaining chapters are available for 99¢ each via IAP. I haven’t had a chance to dive into this one yet, but I’ve enjoyed a number of Daedalic Entertainment’s previous adventure game productions, so I’m excited to check this one out as well as it sounds right up my alley. First, from Outline Development (The Game, Camel Up) comes their anticipated official digital adaptation of Steffen Benndorf’s dice placement game, Qwixx. 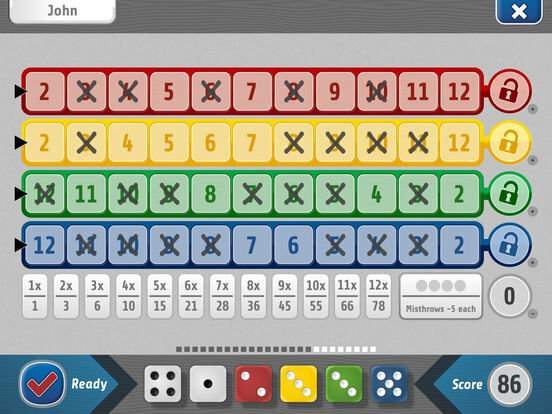 In Qwixx players are trying to use the sum of the dice to check off rows of numbers on their score sheets. The goal is to check off as many numbers as possible in each colored row, before closing them out or running out of “misthrows” Each scoresheet has 4 rows with the red and yellow ones counting upwards from 2 to 12 and the blue and green counting downward from 12 to 2. Players take turns rolling 6 dice (two white, 1 blue, 1 red, 1 green and 1 yellow). The rolling player may then take the sum of the two white dice and mark off one number (of any color on their score sheet) and they also have the option of taking one of the white dies and adding it to one of the colored dies to mark off that colored square. They may do both or one of these actions, or none, which will cost them 5 points and one of their (four misthrows). Each of the other (non-rolling) players, must mark off one square (of a color of their choosing) equal to the sum of the two white dice, or take a misthrow. Once you mark off a number you no longer have access to any of the numbers in that row which are to the left of the box you checked. Since your per-row points scale by the number of boxes you have checked in that row, skipping to far ahead in a row can really limit your point potential. 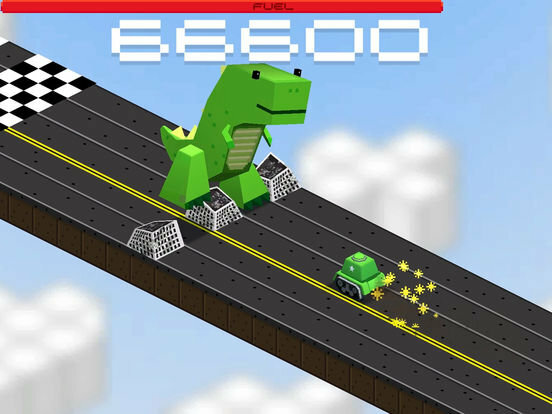 Qwixx is a fun strategy game that can be played by both kids and adults on an even playing field. The app currently supports solo play (just for a high score, no opponent) or two players on the save device via split screen. You can also use the app just as a dice roller, or as a scoresheet (this could use an undo option). So if you have a family of four, theoretically, each player could load the scoresheet on their own device and another device could be used as the dice. My 9-year-old daughter and I played together on an iPad and it worked out great. The app offers players not only the standard scoresheet, but two variant setups which shake up the strategy. The developers have told me that there will be an update with CPU players very soon and they are currently looking into a way to provide an option for playing online. While the current lack of online play is a bit of a bummer, overall it is a nice implementation. 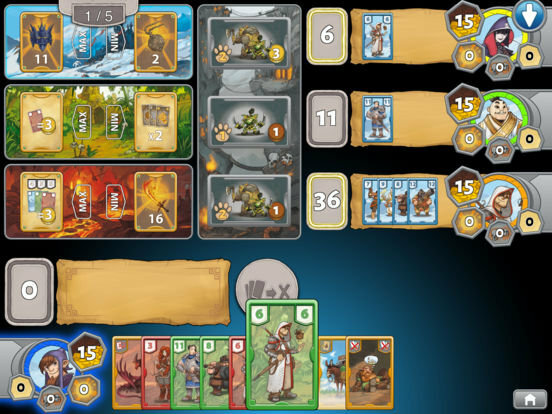 It has been several years since Queen Games (Kindgom Builder, Alhambra) has brought us a digital port, but this week they return with an iOS version of Richard Garfield’s 2015 card drafting game TreasureHunter. Played over the course of five rounds, players take on the role of Treasure Hunters (surprise). In each round you take one card and pass the rest to the left (or right, depending on the round) until each player has 9 cards. The objective is to have the most wealth at the end of the game. In each round, players use their drafted hand of 9 cards to either win (or avoid winning) that round’s treasures. Each of the three colors have treasures which will be awarded to the player has the played most (and least) points of each of the colors. Some treasure are worth negative points and will want to be avoided. There are some additional rules, but that’s the basics. The app allows for both local and online play for up to six players (including CPU players). A couple of expansions are available as IAPs. And I’ll round out the week with a couple of excellent PC ports from indie developers (and my two favorite new games of the week). 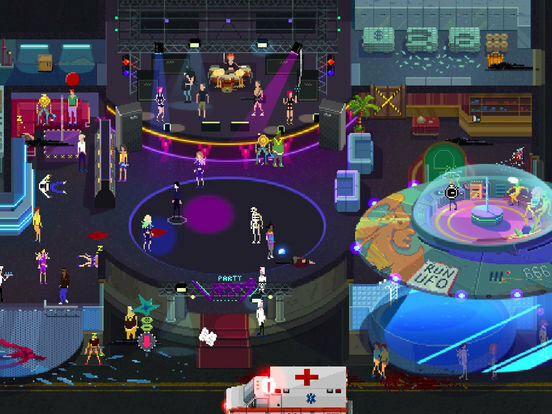 First up is Party Hard Go, a crazy game of stealth revenge from tinyBuild, which feels like a sort of mashup of Dexter, American Psycho and Neighbors. It’s 3am, your neighbors are having a loud party and you just want to get some sleep. Instead of calling the police like a normal person, you decide to take matters into your own, murderous hands. Trying to blend in, you must your way through the intoxicated party guests, killing them all off, disposing of bodies when convenient and (hopefully) avoiding notice and evading the police when necessary. If the bodies of any of your victims are found, the police will be called and then you need to blend in. You can trigger traps to take out large numbers of guests at a time, or discover a change of clothes to avoid capture or even better weapons to make your task more efficient. Take your time and savour your kills to avoid making costly mistakes which would otherwise get you captured and arrested. During the course of the narrative, you’ll make your way through 19 unique locations from a BBQ Party, to a Boat Party and more. You’ll play as 5 different playable sociopaths including a knife-wielding sleep deprived guy, a ninja, a cop, a girl and a butcher with a chainsaw. To top it all off, the game features great 8-bit art and an awesome soundtrack. The whole premise of Party Hard Go is super strange and more than a bit disturbing, yet unnervingly satisfying, highly recommended. 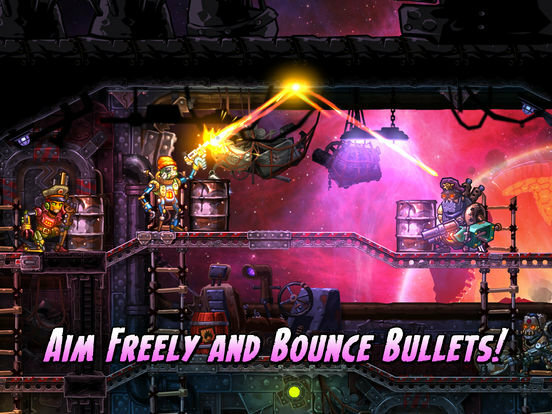 Finally that brings us to SteamWorld Heist, a stellar turn-based strategy game set in a steampunk universe where you command a crew of robotic space pirates. Each mission requires you to carefully move and position your crew-member(s) throughout an enemy ship to collect goods, take out enemy crew and complete a variety of goals. Either through collected loot or by visiting space merchants, you can unlock a variety of new weapons, each with their own unique stats (even the possibility of friendly fire) as well as armor, shoes that let you move further and more. During battle, one of the fun little touches is the ability to literally shoot the hat right off your enemy’s head and then collected it from their fallen pile o junk for your own crew members to wear. As you navigate the enemy craft, you’ll want to strategically position yourself behind barrels and other items for cover and depending on how far you move on your turn, you may be able to both move and fire. To shoot on an enemy, you simply drag you aiming reticle where you want to fire and then tap it at the right moment. Sometimes to hurt an enemy, you may need to bank your shots by planning out the proper ricochet to have an obstructed shot reach its target. Along the way, you can hire new crew-members, each of whom will earn experience while on missions which will let them level up, unlocking new abilities and skills. I first saw and unfinished version of the iOS release of this game at PAX East earlier this year and now that I’ve gotten my hand on the final release, I am absolutely loving it. The overarching story is entertaining and the characters are charming, it easily offers 15-20+ hours of gameplay and is very deserving of its feature by Apple. A must buy! That’s all I have for you this week, enjoy!